Bromeliads are another largely tropical plant family with a devoted following among horticulturists. You are probably familiar with two species of the genus Tillandsia, although you may not have known they are bromeliads: our native ball moss and Spanish moss! Like orchids, most bromeliads are epiphytic – meaning that they grow on other plants. We have several bromeliad species in the Center, including some of the terrestrial ones. 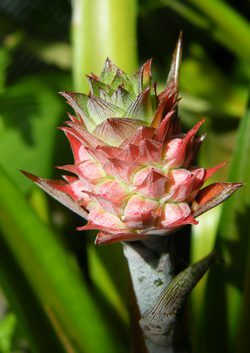 The most famous of the terrestrial species is Ananas comosus, which provides us with delicious pineapple!